Doesn’t food look great in a cast iron skillet? Of course, it tastes great when made in a cast iron skillet. 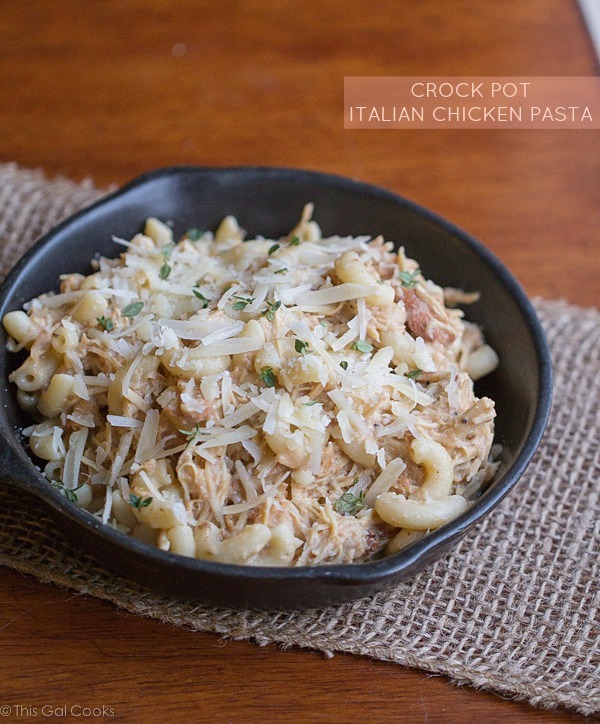 But alas, this recipe is actually a crock pot recipe, hence the name Crock Pot Italian Chicken Pasta. But I just couldn’t help but use this little mini cast iron skillet when doing the food photo shoot. I tried a cream and deep orange colored bowl but it just didn’t compare to the look of this cute little cast iron skillet. Plus, this mini skillet was looking for another job. Right now, it’s full time job is holding k-cups on my coffee bar. It wanted a change so I hired it to be one of my food props. Ah so, can you believe that it’s already March? I just noticed that the trees in my yard are starting to sprout new leaves. For those of you who don’t live in Florida, yes, the trees start sprouting new leaves pretty early in the year. Sometimes late February but usually March. Oh and the weather is beautiful. We have our A/C turned off and our windows open. Sorry, northern folks, I’m not rubbing that in too much, am I? THIS is good. Very good. Like knock your socks off good. Chicken slow cooked in a homemade cream of chicken soup mix, greek yogurt and Italian Dressing Seasoning mix. Nuff said. 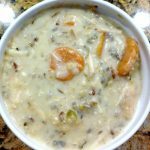 Homemade cream of chicken soup mix? Yeah, I’m not too big on all of the ingredients in the store bought stuff. At least not anymore. I used to use the store bought stuff quite often but then I realized it’s pretty easy to make your own mixture. Half and Half, melted butter, chicken stock, all purpose flour. That’s it. Just whisk together and you have something similar to canned cream of chicken soup without the long list of ingredients! Kind of ironic, though. I did use store bought chicken stock but you can use your own if you have some of your own homemade stock. If you don’t have time to make your own stock, or if you don’t have any laying around, you’ll be pretty safe using an organic broth that you can pick up from your grocery store. 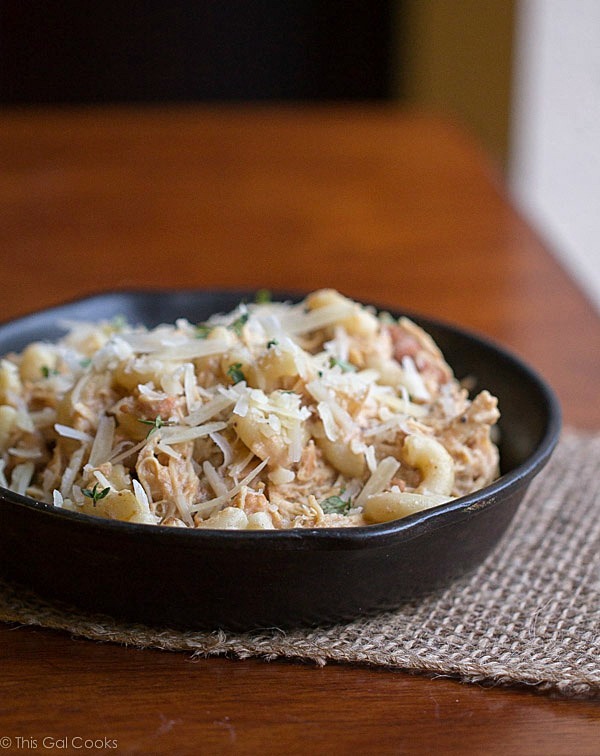 This recipe was adapted from Julie’s Eats and Treats Crock Pot Chicken Bacon Ranch Pasta. Spray your crock pot with cooking spray, or line with a crock pot liner. Place the chicken in the crock pot. Whisk together the half and half, chicken stock, all purpose flour, melted butter, garlic, Italian dressing seasoning, Greek yogurt and ground pepper. Pour over the chicken in the crock pot. Cook on low for 6 hours. When done cooking, remove the chicken from the crock pot and shred. Whisk together the liquid in the crock pot until smooth. Return the chicken to the crock pot and mix well, until it's coated with the liquid/sauce in the crock pot. Cook the macaroni until it reaches your preferred firmness. Drain and then mix the macaroni with the chicken mixture in the crock pot. Serve in bowls and top with Parmesan cheese and fresh thyme. I love that this doesn’t use canned soup! I have a version that does – & it’s pretty popular – but I’ve steered clear of canned soups for the past year or so. Thank you! I have like 5 cans of cream soups in my pantry but I just haven’t wanted to use them. I am trying to steer clear of a lot of processed foods! Thanks for stopping by, Melissa! Love an easy and delicious crock pot recipe – thanks for sharing! That is one cute skillet!! Glad you enjoyed it Julie! I love how things look in a skillet! It really showcases the food. And this recipe sounds like the perfect dish to come home to after a long day at work. In fact, yes you are rubbing it in too much….about the weather that is!! 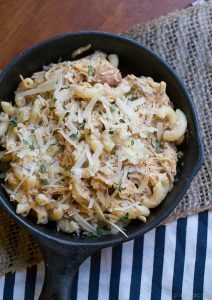 ;) Now this crock pot dish looks delicious! And I agree about cast iron skillets making everything look better! That must be why we have several sizes in our own kitchen!! Thank you, Renee! 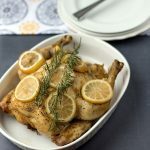 I just love how easy they are to use too – stove to oven in a cinch! It means less dirty dishes for me to clean! 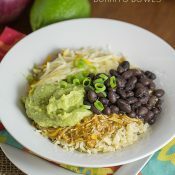 Loving this easy crock pot dish! 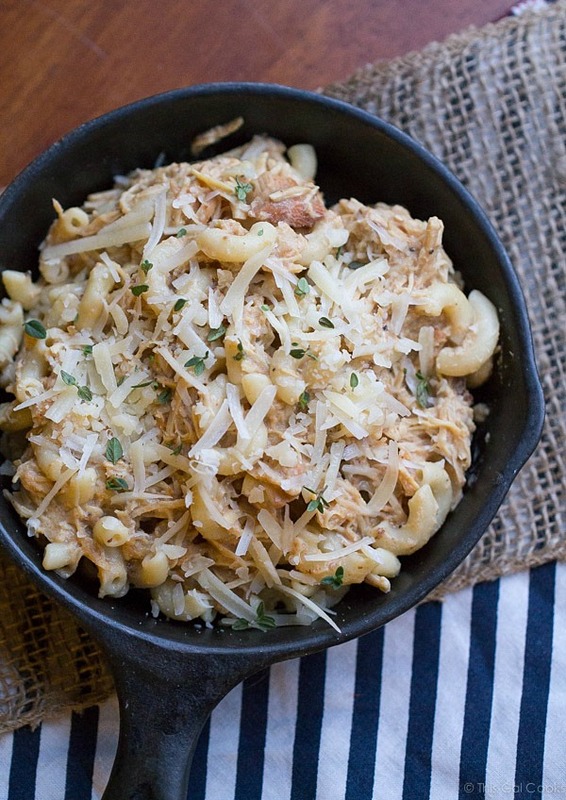 I have never made pasta in a crock pot before, can’t wait to try this one Julie! Pinned and sharing! Iron skillets rock! I love cooking with them because well, they just cook the food evenly and you can go from stove-top to oven! Great looking dish Julie! I can see why you were raving about it…. I’ll need to put it on my to do list! I’m looking for some new recipes to try. Have a good week! Oh you can get the mini skillets from World Market. I think they are $5.99 each. Now I may or may not have somehow ended up with one at my house after visiting a restaurant a few years ago. ;) But I was looking to buy some and I found them on the World Market website. I think this sounds delicious Julie. Pinned. Yes, us northerners are sick of winter!! Looks like a truly comforting pasta Julie! I could eat it right out of that mini skillet! Thank you Laurie! I hope you enjoy it! Hehe, totally wishing I was in Florida right now instead of looking at snow :) This pasta looks amazing Julie! Totally dig cast iron skillets and pans – they cook so evenly and look fantastic served right off the stove :) Pinning! Agree, I love the look of the food in a mini cast iron skillet! I got one from a garage sale last year or so but haven’t used it yet. I know, what have I been doing?! This pasta looks so good. 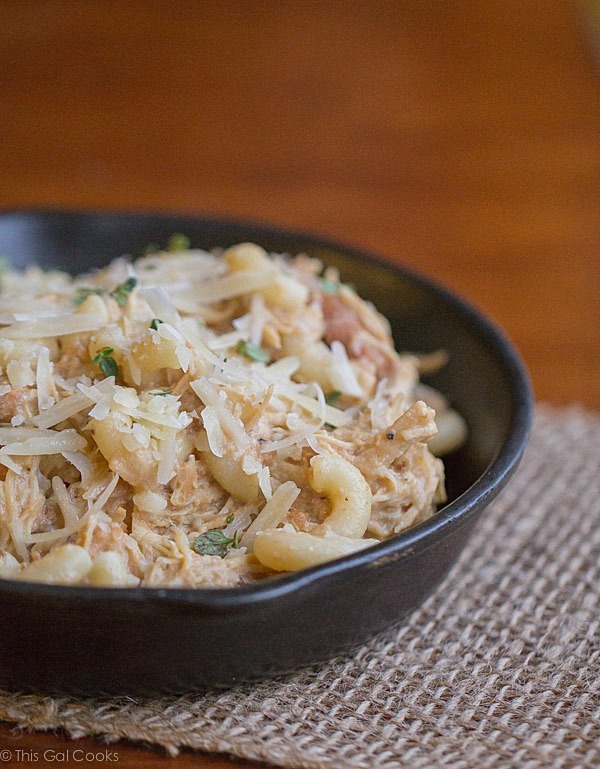 We need this comforting pasta dish on weeknight! I love the flavors in this dish, Julie! The Italian dressing and yogurt must give it a great tangy flavor. Pinned! This looks absolutely fabulous! I’d love for you to come share at Simple Supper Tuesday. You know how I feel about my slow cooker meals, Julie. ;) This one looks delicious… and I LOVE that you used Greek yogurt in this! Definitely going to have to add this one to my menu plan for next week. Can’t wait to try this! Totally agree about canned soups, yuck! Also I have found that you can replace an Italian dressing seasoning packet with 1/4 red wine vinegar + 1 tablespoon Italian seasoning blend for crock pot recipes if you want to exclude the additives they put in those packets. Oops! That was supposed to say 1/4 cup! I made this yesterday. I used whole wheat spiral pasta. I doubled the recipe to ensure leftovers. Tonight I put the leftovers in a stone baker. Added a thin Ritz cracker crumb layer and some little pieces of butter. Reheated at 350 for 30 minutes. It was delicious. Two fabulous meals from one simple recipe. Thank you! Made this last night and both my husband and I absolutely loved it! As well as the baby in my tummy :) Thank you for a recipe we will use many more times to come in the future! So happy that you and your husband liked this recipe. Thank you for stopping by to let me know. :) Enjoy the weekend! I just made this on Monday and it was DELICIOUS! My 10 month old daughter went crazy for it. We decided to put it on top of zucchini noodles instead of macaroni and it tasted amazing. I will definitely be making this again!